Callaway Diablo Edge RH 7 Fairway Wood, used and generally in good condition but a little wear and tear on headcover. Callaway Grip, Standard size on Callaway Diablo Edge Shaft mid torque/low kick/55g A Flex, Seniors. Callaway GBB Epic 3 Wood. Hardcover and adjustment tool included. 15 degree loft ( 2/-1) Regular shaft - HZARDUS 5.5 Item used and still in good condition. Some wear on the shaft from rubbing in the bag (shown in pictures). This wear does not effect performance and is only surface damage. Great 3 wood that goes a long way. Any questions please ask. New listingCALLAWAY BIG BERTHA STEELHEAD111 No 3 FAIRWAY WOOD . GRAPHITE FIRM FLEX SHAFT. CALLAWAY BIG BERTHA R/H STEELHEAD 111, No 3 WOOD, GRAPHITE FIRM FLEX SHAFT. A GOOD EASY TO HIT CALLAWAY FAIRWAY WOOD THAT CARRIES DISTANCE. ORIGINAL CALLAWAY GRIP. HEADCOVER. MINIMAL USAGE MARKS ONLY.NONLY.NO SHAFT BAG MARKS. Head: 8/10. Shaft: 8/10. Uniflex. Grip: 8/10. Head cover: 7/10. Not original. Overall the club is in very good condition. Buyer can collect to avoid postage charge with cash on collection. Callaway Diablo Octane RH 3 Fairway Wood used and in good condition with new Callaway headcover. Callaway Grip, Standard size on Callaway Diablo Shaft mid torque/low kick/A Flex 55g Seniors Shaft. Head: 7-8/10. Shaft: 8/10. Uniflex. Grip: 8/10. Head cover: 7/10. Not original. Overall the club is in very good condition. Buyer can collect to avoid postage charge with cash on collection. The head, shaft,grip and head cover are in good condition. See photos. Callaway X Hot RH 3 Fairway Wood, used and generally in good condition but note fraying to headcover sock in photos. Callaway Grip, Standard Size on Project X PXv R Flex Regular Shaft. Head: 8/10. Shaft: 8/10. Firm flex. Very Slight bag rub. Grip: 7/10. Head cover: 7/10 Overall the club is in very good condition. Buyer can collect to avoid postage charge with cash on collection. CALLAWAY XR 5 FAIRWAY WOOD & HEAD COVER. The XR Fairway wood features higher ball speed & forgiveness technology. Super Callaway quality in great condition. Flatter leading edges & a higher toe & with a face height that is shallower provides an easier to use club from any type of lie. Condition is Used but in really good condition - no sky marks. headcover included - original one unused. The new Epic Flash Sub Zero fairway wood combines all of the groundbreaking technologies of the Epic Flash fairway wood with precision shot-shaping technology for high swing speed players. Epic Flash Sub Zero Fairway. CALLAWAY GREAT BIG BERTHA 5 WOOD BASSARA e42x 5ct LIGHT FLEX shaft complete with head cover great club upgrading so selling you will not be dissappointed ALSO selling great big Bertha driver see desperate listing Condition is Used. Dispatched with eBay delivery – Shutl 1 day. Callaway Rogue 3 Wood. Condition is in great condition as the club has only been used a couple of times as you can see from the pictures. Loft is 15° and the shaft is an Even Flow Project X stiff - 6.0 S 75G. Great for improving your game due to the Callaway Jailbreak technology. Also selling a Rogue Driver so can combine the shipping. For age good condition . No head cover. Adjustable head. Regular Flex. Callaway XR 7 wood, which is 21 degree non adjustable. 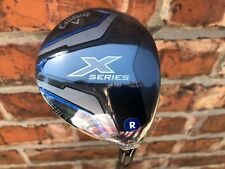 Callaway X Hot RH 5 Fairway Wood used and in good condition with headcover. Callaway Grip, standard size and Grafalloy ProLaunch 65R Regular Shaft. Callaway Big Bertha V Series 3 Wood. Standard size Callaway Grip. 15 Degree loft. Mitsubishi Bassara 52 Gram Regular Flex Graphite Shaft. New Callaway X2 Hot 3 Deep Pro 3 Wood 14.5 Degrees Tour Aldila 75g Shaft Stiff Flex. Brilliant 3 wood. I bought this as a back up for my one but just never used it so it's now for sale. No offers please just an auction. My feedback assures you of 100% quality item. New listingCallaway Epic Flash Gents 5 Wood 18 Degree R/H Reg Flex. Callaway Epic 3 Wood. Stiff Shaft - 15 Degree. Adjustable Head. Condition is Used. Head and grip in good condition, shaft in excellent condition. Original headcover is missing so comes with a Callaway Rogue headcover. GOLF LADIES 3 WOOD, CALLAWAY BIG BERTHA WAR BIRD, RIGHT HAND, LADIES FLEX GEMS SHAFT, ORIGINAL HEADCOVER, VGC. New listingCALLAWAY RAZR EXTREME FAIRWAY WOOD 3 Final reduction! Callaway X2 Hot Fairway. 3 wood 15 degree x2hot 65 regular shaft.10/10. Original Callaway shaft.10/10. Only been used for one 18 hole round. Overall in excellent condition! Will not be disappointed! Thankyou & Goodluck! Callaway Big Bertha Steelhead III 3 Wood. Really nice club in great condition. Mitsubishi Bassara E52 Lite / seniors flex graphite. Big Bertha V Series. Yes - non matching Callaway FT-i cover. Head 5/10, Shaft 5/10, Grip 6/10. All wear is normal. Photos are of actual product. Head: 7-8/10. Shaft: 8/10. Grip: 7-8/10. Head cover: 7/10 Overall the club is in good condition. Buyer can collect to avoid postage charge with cash on collection. The club, shaft and grip are in is in good general condition. Two small bag rubs shown on last photo. Callaway XR3 Fairway wood Stiff . Condition is Used. Approximately 12 months old only used a couple of times. Very good condition. Paid £129.99 as new.With head cover. This auction is for my Callaway Rogue 15deg 3 Fairway wood. I bought this club new last summer. I am a senior golfer, so it has been used very lightly, and as a result is in “as new” pristine condition. The only way to tell it from new is a few tiny ball strike marks on the face. The rest of the head, shaft, grip and cover are unmarked. The shaft is the Regular flex 60 gm. Aldila Synergy, fitted with a mid-size Golf Pride grip. A good opportunity to acquire a top range club at a fraction of the £200 they are currently selling new for. Very good condition Callaway X2 Hot 3 wood. Club has a 14.5' Pro loft, Aldila regular graphite shaft and original Callaway grip. RIGHT HANDED. Condition is Used. NEW LAMKIN Z5 GRIP NO MARKS ON SHAFT. NO MARKS ON TOP OFF HEAD ONLY BALL STRIKING MARKS TO FACE, AS USED. Head: 8/10. Shaft: 8/10. Firm flex. Grip: 7/10. Head cover: 7/10 Overall the club is in very good condition. Buyer can collect to avoid postage charge with cash on collection. Introducing the Rogue fairway from Callaway Golf. The Rogue Fairway Wood Features Triaxial Carbon Crown. This gives more forgiveness on off centre hits, provides a high launch and strong, straight ball flight. Fubuki Z65 Stiff Flex Graphite Shaft. Callaway Big Bertha. New Callaway Grip fitted. 15 degree 3Wood. CALLAWAY RAZR X BLACK 4 WOOD. Condition is Used. Dispatched with eBay delivery – Shutl 1 day. 17 degree, excellent custom fitted Harrison Eclipse shaft. Black & white Golf Pride New Decade multi compound grip. Comes with original head cover. Head in good condition, some loss of colour on underside, other than that vgc. Grip in good condition, shaft has a small area of wear from rubbing against bag, other than that again vgc. Any questions please ask. It has a A flex shaft Fujikura shaft, Golf Pride grip and head cover. If you swing your driver at less than 85mph, then this shaft option is ideal as it launches high and is accurate. GOLF LADIES HEAVEN WOOD, CALLAWAY BIG BERTHA, RIGHT HAND, LADIES GEMS SHAFT, ORIGINAL HEADCOVER, VGC. CALLAWAY STEELHEAD XR FAIRWAY 3 wood, virtually Brand new TENSEI stiff shaft, CK Series 65, Mitsubishi Chemical. The Condition of the club is Used but virtually brand new. Slight mark on the toe to the club face and slight line on the top of the club head, barely noticeable. Callaway UTX standard Lamkin grip. Dispatched with eBay delivery – Shutl 1 day. Callaway Epic Flash Gents 5 Wood 18 Degree R/H Reg Flex.